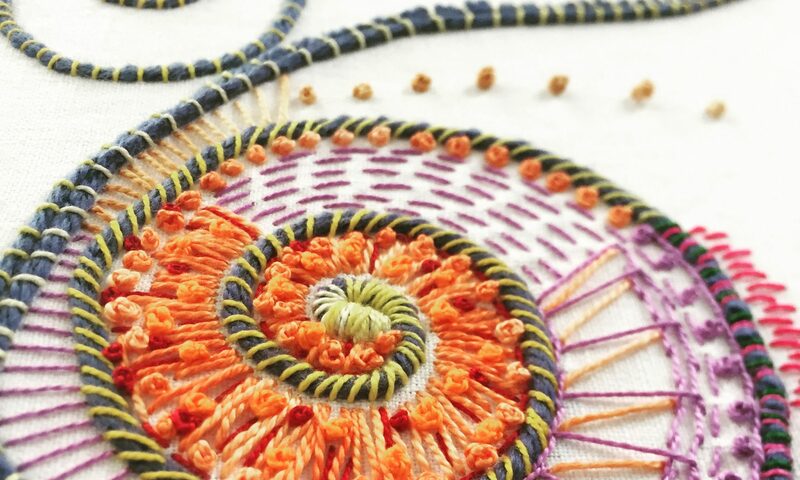 Deadheading annuals and perennials is no longer such a chore, now I look forward to gleaning the spent blooms to eco-dye fabrics that I can use to create intentionally embroidered objects. 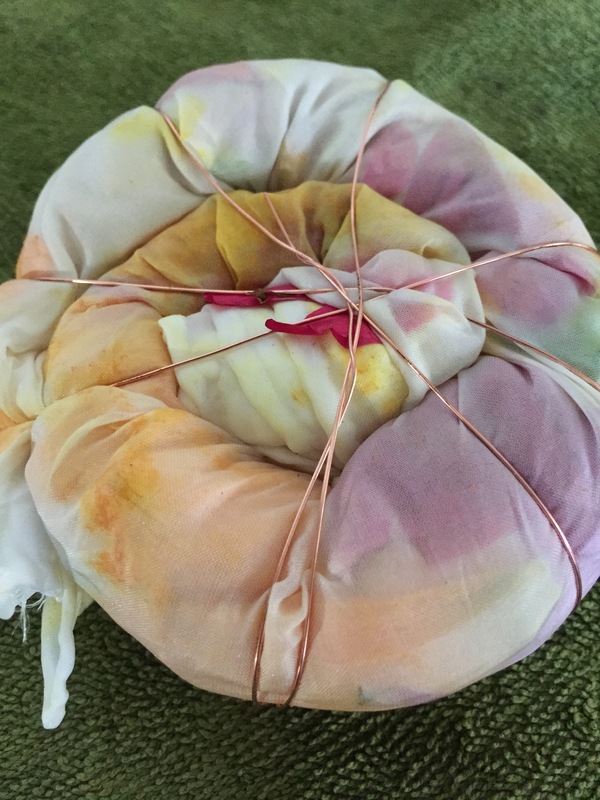 Sunday I bundled a dozen silk fabrics with zinnias, hibiscus, maple leaves and some native Pennsylvania wildflower heads, with various tea leaves and spices, rolled them up tightly, wound into spirals and wrapped rightly with copper wire. Placing them into zipper bags with vinegar and then into a small washtub to wait…2 – 3 weeks before removing them and drying the fabrics which will then be ironed. Its a hedgewitchy-alchemical process, the gathering, crushing the flowers, making these brews and the waiting. Its a slow process. And much slower than opening a tube of paint and squirting it out, blending and brushing it onto a canvas. It is spontaneous though and allows for much experimentation which I appreciate. This is part of an evolution that I am in—-slowing down—-making the art slowly, mentally absorbing the process documenting it. The waiting, wondering which blends will be favored and successful. When I woke this morning, I checked them first, as they reside in my bathtub, packed into a small red washtub, the aroma of flowers and spices hit me full in the face. What a pleasant way to make art. 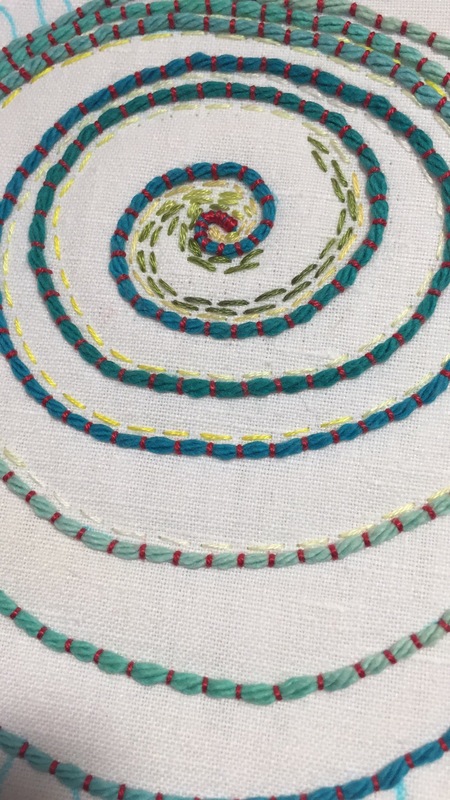 Spirals are making their way into my work again, aboriginal and abstract, the essence of life, they are an image that seems to be often found in my art. the essence of what connects as humans. Couching silk/bamboo yarn onto a vintage linen napkin. Red threads were used traditionally in Red Work Embroidery and Turkey Work.